Leader of Opposition and BJP President L.K. Advani today led a walkout of NDA members in the Lok Sabha demanding a clarification from the Prime Minister on the reported quarrel between Union Minister Laloo Prasad Yadav and Ram Vilas Paswan, even as Mr Yadav made a personal clarification that the reports were incorrect and untrue. The UPA government in its reply to the Supreme Court notice on “tainted” ministers issue, has defended the inclusion of persons with criminal backgrounds in the ministry but said there was no constitutional bar on them either. A special court here today rejected the bail applications of 15 persons in the Bilkis Bano case. With the induction of the twin-seat multi-role Sukhoi-30, and the moves to acquire air-to-air refuelling capability and (AWACS), the IAF is on the threshold of a change in the way in which it projects air power and conducts air-operations. 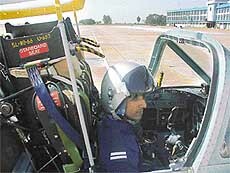 A cadet strapped up and ready to go in a Kiran jet trainer at the Air Force Academy in Dundigal. Defence Minister Pranab Mukherjee today called for tri-service unison to build up a conventional military capability to defeat any enemy, in case deterrence failed. Bollywood stars Sanjay Dutt and Sameera Reddy at a press conference of the Hindi film 'Musafir' during the 35th International Film Festival in Panjim, Goa, on Wednesday. Film Bazaar was inaugurated with much fanfare here on the sidelines of the 35th International Film Festival of India but the response has been lukewarm at best. Foreign buyers are just not there. In fact, distributors from Punjab, UP and Delhi regions too have not bothered to come. Sixteen years after the gunning down of the country's ace badminton player Syed Modi in front of Lucknow's K. D. Singh Babu Stadium, the CBI today suffered a major setback in the murder case as the Supreme Court discharged Uttar Pradesh MLA Akhilesh Singh, a key accused. The Department of Posts will release a commemorative postage stamp on Bhagat Puran Singh, a famous philanthropist, on December 10, 2004. In a unique event, the district police invited 1,570 history-sheeters for a tea party and only 274 of them turned up for the event. Swedish Secretary of State Hans Dahlgren today presented to External Affairs Minister K. Natwar Singh replicas of Rabindranath Tagore’s Nobel Prize medal, stolen eight years ago. Former Censor chief Anupam Kher's defamation suit against CPM General Secretary Harkishen Singh Surjeet has been adjourned by a local court till December 15. Magistrate C.B. Havelikar adjourned the matter as Kher was not present in court for verification. Himachal Pradesh Chief Minister Virbhadra Singh today met Prime Minister Manmohan Singh and demanded that the Centre should provide industrial incentives to the state at a par with Jammu and Kashmir and North-Eastern states. Farmers' agitation over water distribution intensifies in Rajasthan. Lillette Dubey—an actress of great caliber. Raising the issue during Zero Hour, JD (U) member Prabhunath Singh said the government owes an explanation on the issue and a statement from the Prime Minister on the issue still awaited. The Railway Minister who was present in the House sought to make a personal clarification amid the din. “I have not said anything,” he said and termed the reports as “totally incorrect and untrue”. Mr Advani said the House was not interested in listening to a clarification from one of the two ministers involved in the reported quarrel. “The Prime Minister should clarify on the issue. It is a question of collective responsibility. It has been reported in the media that the Prime Minister had summoned both the ministers on the issue. We would like to know what was the outcome of his efforts and what is the situation now,” Mr Advani said. BJP Deputy Leader of the House V. K. Malhotra said that one Cabinet Minister casting allegations on a colleague was a serious matter and the Prime Minister should make a statement. Speaker Somnath Chatterjee said he could not compel the government to make a statement. “You have made your observations and these are on record. It is for the government to respond,” the Speaker said. Parliamentary Affairs Minister Ghulam Nabi Azad said that after the Minister had clarified, there was no need for a clarification from the Prime Minister. Not satisfied with the response of Mr Azad, BJP and other members of the NDA staged a walk out. The UPA government refusing to concede to the Opposition demand for Prime Minister’s statement on the spat between Union Ministers Laloo Prasad Yadav and Ram Vilas Paswan, the NDA has decided to call a meeting of its leaders tomorrow to chalk out their strategy to be adopted in Parliament. “The NDA leaders will meet tomorrow to decide on the strategy to be adopted by the Opposition in Parliament in the wake of stubborn attitude of the UPA government on various issues, especially on the spat between Laloo Prasad and Ram Vilas Paswan,” BJP Parliamentary Party Spokesperson V.K. Malhotra told mediapersons here. Among other issues on which the NDA meeting is expected to discuss is the strategy to be adopted by it to deal with the possibility of the UPA government refusing to take up debate on price rise under Rule 184, which entails voting. In another setback to the Bharatiya Janata Party, its former spokesperson Sunil Shastri, son of country’s second Prime Minister Lal Bahadur Shastri, today resigned from the party. Mr Shastri, who was paraded by the BJP as a big catch when he joined it in 1998 after leaving the Congress, met party President L.K. Advani at his residence here and tendered his resignation. Mr Shastri declined to reveal his future plans but sources said he is likely to rejoin the Congress. Talking to The Tribune, Mr Shastri said his supporters from across the country would come to the Capital on December 10 when they would all march to Vijay Ghat Samadhi of the late Lal Bahadur Shastri. 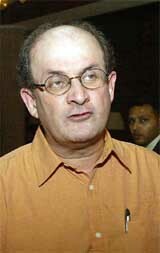 Mr Shastri’s return to the Congress would strengthen the party’s chances in Uttar Pradesh where he enjoys support. Initially, Mr Shastri was made member of the party’s national executive and later elevated as General Secretary and spokesman. But then his claim to the Rajya Sabha earlier and denial of ticket for the Lok Sabha elections was ignored. Mr Shastri, who floated Jai Jawan-Jai Kisan Forum a few months back, was not willing to remain in a party where he was not wanted. He was a national secretary in the Congress and was a Cabinet Minister in Uttar Pradesh for 12 years. Mr Shastri, who was with Mr Advani for 45 minutes, did not make any comment to the media. Earlier, he visited the party headquarters and expressed his gratitude to staff members. Mr Shastri’s brother Anil is a special invitee in the Congress Working Committee. “There is at present a coalition government which has formed the UPA and there are various parties which are part of the coalition. The MPs from such parties would be required to be considered for inclusion in the Council of Ministers, if the parties so desired and the ultimate decision is taken by the Prime Minister,” the Congress-led UPA government in an affidavit said. The PIL, filed by Mr Manoj Narula, had raised the issue of inclusion of ministers with “criminal background” in the ministry. The apex court, taking cognisance of it, had issued notice to the government on July 16 seeking reply on the inclusion of Railway Minister Laloo Prasad Yadav, his party colleagues — Mohammed Taslimuddin, M.A. Fathmi and Jia Prakash — and JMM leader Shibu Soren in the Council of Ministers for their being chargesheeted in criminal cases. ground that the matter of “tainted” ministers was being debated in Parliament and it would not be proper for the court to interfere in it, had issued the notice after Mr Narula’s counsel had succeeded to convince the court to review its decision. He succeeded in getting the notice issued after placing the facts on record that the debate on tainted ministers issue had never taken place in Parliament. However, the government in the affidavit had tried to put the blame for scuttling the debate on the Opposition, which had not allowed Parliament to function smoothly during the monsoon session while raising the issue of these minister’s criminal background. A special court here today rejected the bail applications of 15 persons in the Bilkis Bano case. In this case, 20 accused, including a doctor couple, were arrested for their alleged involvement in rioting, murder and gangrape of complainant Bilkis Bano, while she was six months pregnant, on March 1, 2002. While rejecting the bail applications, Additional Session Judge U.S. Salvi, who is presiding over the trial of case, said the prosecution should be given fair opportunity to establish fact or prove their case during the trial. Judge Salvi further said that there was a possibility that the accused may flee or tamper the evidence. As a result granting bail to the accused persons at this juncture was premature. A senior police official from Gujarat, Gandhinagar SP R.B. Brahmbhatt appeared before the special court hearing the re-trial into the Best Bakery case. Special Judge A.M. Thipsay had summoned Mr Brahmbhatt after it was found that three Gujarat police officials had accompanied Saira Shaikh, sister of Zaheera Shaikh, a prime witness in the Best Bakery case. These three plain cloth- men were paid in cash by Mr Brahmbhatt. However, they did not have any duty pass, an issue that was raised by the prosecution. The court has given time to Mr Brahmbhatt to translate the copies of his order to the constables. He will shortly be examined by the court. PTI adds: Mr Brahmbhatt told the court that he was given to understand by his juniors that protection was to be given to Zaheera and her family. He also said that protection was to be given to them for their movements anywhete in the country. He was then shown the DGP order wherein it was stated that the security was restricted till the Gujarat border. The court pulled up the police officer asked him if he was lying. To this, he said that the DGP had extended the security of Zaheera and others up to Mumbai. About the police lapse in not providing security to six other witnesses, the SP said he was given to understand by his colleagues that the cover was for Zaheera and her family. Asked why no woman constable had accompanied Zaheera, the Gujarat SP admitted the lapse and said his department did not have any women constable. Besides, he said, he was told by his colleagues that Zaheera’s husband would also be going along with them. With the induction of the twin-seat multi-role Sukhoi-30, and the moves to acquire air-to-air refuelling capability and (AWACS), the IAF is on the threshold of a change in the way in which it projects air power and conducts air-operations. The Air Force Academy (AFA), in Dundigal, near Hyderabad, the alma mater for all IAF officers except the medical branch, has begun to orient itself for that change. There is little visible sign of that change yet. Cadets in the fighter stream still fly the aging, if very reliable, Kiran jet trainers while the piston-engined HPT-32, the basic trainer, still soldiers on. In nearby Hakimpet, Kiran MK-2 continues to roar in the skies, even if it is goodbye to the Iscaras (there will be a farewell flypast during the graduation parade later on this month). Helicopter cadets get their training on the ubiquitous Chetaks at Hakimpet, transport flying stream cadets go to Yelahanka while the technical staff go to Air Force Technical College (AFTC) near Bangalore. But already, cadets are nursing dreams of being selected to fly the new Hawk-100 advanced jet trainers (AJT) being purchased from the UK Several of their seniors are already in the UK for advance training, and more will be selected. The eventual induction of the Hawks, once they start coming in, in 2007, will be at Air Force Station, Bidar, with avionics and weapons configurations to match the Su-30 and the Mirages that pilots will eventually fly. The HAL built intermediate jet trainer (IJT) is some years away from certification and induction (with the AL-55i Russian engine), but is the eventual replacement for the Kirans. The academy currently has around 32 Kirans and 55 HPT-32s. But in the very next term, the cadet strength, currently 370, will go up to 425. Of the around 80 cadets graduating in the flying stream this term, over half have been earmarked for the fighter stream. The induction of the Sukhoi-30 itself (50 bought outright, and 145 to be assembled by HAL over the years) means that the pilot requirement will double — the Sukhois are twin seaters. What is more, with such advanced planes, which are capable of being refuelled in the air, and possess advanced weapons for both land attack and air defence, general manpower requirements for ground support will also increase. The induction of air-to-air refuellers, and AWACS which carry large teams on board, and are escorted by fighters, will mean more technical staff as well. Candidates in the technical stream, who currently go to the AFTC will soon be going to the new Air Force Engineering College, slated to begin taking in students next year. Technical officers will also need to orient themselves to the high-technology operations of the future. Defence Minister Pranab Mukherjee today called for tri-service unison to build up a conventional military capability to defeat any enemy, in case deterrence failed. “Our aim in this country has always been to try and prevent wars through deterrence and diplomatic activities. But deterrence many a times fails as we have witnessed so often in the past,” he said. Therefore, the country’s conventional military capability should not only provide credible deterrence but also the ability to defeat the enemy in case of deterrence failure, Mr Mukherjee said in his address, read out in absentia, at the inauguration of the two-day seminar on “Air Power in the New Millennium” here. “This requires the three arms of the defence forces to work in unison for the common objective,” he stressed. The Defence Minister underlined the importance of air power in combat as well as in the civilian side of the nation’s life and well-being. “People often forget air power is not merely bomber and fighter aircraft,but has a crucial civilian role,” Mr Mukherjee said. “Air transportation is increasingly linking people and economic activities within our country, and between our country and the rest of the world,” he said, adding that the Indian air transport fleet’s record in evacuating 117,000 Indians out of the 200,000, who became hostages to the Gulf War in 1990-91. Speaking on this occasion, Air Chief Marshal S. Krishnaswamy stressed the importance of air power for the present operational environment, characterised by presence of nuclear weapons as well as terrorism. “The operational environment has greatly changed with the presence of nuclear weapons as well as the scourge of terrorism. This has led to due changes in the application of technology and tactics,” he said. The Air Chief said terrorism could not be tackled simply by the “number of tonnes of bombs” dropped, but by more sophisticated means. “It requires the effective integration of unmanned aerial vehicles (UAVs) and other sensors, including those which are space-based to make out what is happening. The sensor to shooter cycle, which earlier used to take days, has now been reduced to minutes,” he said. “The air force, or for that matter, air power, belongs to the whole nation. It has the ability to enforce the nation’s will, as was demonstrated by the US enforcement of a ‘no-fly’ zone over Iraq earlier,” he said. Suggesting ‘special capsules’ for decision-makers to enhance their knowledge of air power, Krishnaswamy also emphasised the ‘challenge’ before the leadership to have ‘’a vision of emerging technologies, in terms of its applications and cost benefits’’ and to employ it productively. The Air Chief also stressed the need for managing expenditure and striving for greater indigenisation. Noting that innovation was the key, Krishnaswamy, however, cautioned against getting “carried away” by technology and forgetting the importance of manpower. The government today said the troop reduction in Jammu and Kashmir had generated a lot of goodwill and decisions on redeployment would depend on situation in the state. The decision to reduce troops in the state was taken by the Defence Ministry, the Home Ministry and the state government, Defence Minister Pranab Mukherjee said during Question Hour in the Rajya Sabha. In reply to a query by SP leader Amar Singh on whether the government would reconsider the decision to reduce troops in the event of a spurt in terrorist activities, Mr Mukherjee said the question of redeployment depends on the situation. He said so far the decision to reduce troops had been received well all over the country, including Jammu and Kashmir. He assured the members that the government could always reconsider its decision to reduce troop deployment in J&K according to the needs of the situation. The ceasefire along the Line of Control had borne favourable results with infiltration/exfiltration attempts having fallen by 60 per cent when compared to the January-October period last year. The Defence Minister attributed part of this decrease to additional vigilance along the border, barbed-wire fencing along the LoC and deployment of sophisticated surveillance equipment. He said infiltration/exfiltration attempts had registered a increase in November this year compared to previous two months. Replying to another query, he said no agreement had been reached so far between India and Pakistan for reducing the Army in Siachen. 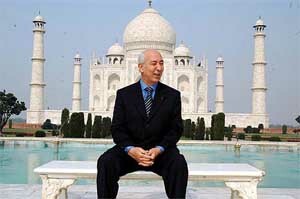 He said the government was considering a proposal to build a National War Memorial at India Gate. The Minister said the Urban Development Ministry was considering allotting land for the memorial and a new concept plan had been prepared by the Defence Ministry to cause least disturbance to the lay out of the Central Vista and to blend the design with the architectural style of Lutyen’s Delhi. He said veracity of the US decision to supply PC-3 Orion Naval surveillance planes to Pakistan had been established. Mr Mukherjee said it was true that allocation made for defence, which includes funds for acquisition of weapon system platforms in Budget estimates in the past few years were not fully utilised. The total funds allocated during the past three years (2001-2004) were Rs 1,92,300 crore while actual expenditure was Rs 1,69,993.36 crore, leaving Rs 22,306.64 crore unutilised, he said. The cause lies in the uncertainty about the holding of the festival. Dates of film markets organised in the US, Italy, Singapore and Hong Kong are announced months in advance, so that the buyers can plan their trips. This has not been the case in India. Only representatives from Mauritius and Brazil have come here, that too to popularise their locations among Indian filmmakers. They are going back none too happy. The same is the grouse of Indian participants. Mr Amit Gedia of the ND Studios who has put up a stall says that since the general public cannot enter the Kala Academy, where the bazaar has been located, the response has been very poor. Zee TV are here but they are only trying to promote their channel Zee Cinema. But Mr Mukesh Sehgal, Deputy General Manager of the NFDC, is hopeful that things will settle down in two or three years and once Goa is declared a permanent venue, buyers will start coming in droves, particularly because Goa is a hot destination and the festival is to be held in a peak tourist season. Shopkeepers of Goa are also a disappointed lot. Their impression was that with so many delegates coming to Goa for the festival, they will receive a windfall. But their hopes have been belied. Most of the delegates remain busy with films from morning till late in the night and few venture out to markets. It is another matter that hotels and taxi operators are making a killing. An international film festival is more about films from abroad than those from one’s own country. At least that is how it should be ideally. But in the Indian festival, the focus tends to shift more towards the home-grown stuff. In any case it is not exactly international either because awards are given only in the Asian section. The quality of non-competition films from other continents is mediocre at best. Retrospectives of the films of great masters would have provided a good opportunity but there too the dice is loaded in favour of Indian makers. Yash Johar is a good filmmaker no doubt but holding a retrospective of these is pandering too much to commercial cinema, isn’t it. Similarly, Ashok Amrithraj’s films may be quite popular but he cannot be called a cinema maestro by any stretch of the imagination. “Dancing in the Dust”, the first feature film of Iranian director Asghar Farhadi, received several prizes in Iran’s national festival last year. It was successful in many international film festivals also. This year, he is here with his second film, “Beautiful City”, in the competition section. It is a grim encounter with reality as it exists in his country. A murderer or his family is supposed to pay a huge sum to the plaintiff if his death sentence is to be reduced to imprisonment. It is for the latter to decide whether he wants to show this mercy or let the culprit hang. The poor ones wait on the death row to beget this clemency. This is the story of a boy who killed his girlfriend when he was 16. He is now 18 and can be hanged any time. His poor sister and best friend try to plead before the adamant father of the murdered girl to change his mind. Many complicated situations arise which the director leaves unresolved to let the viewer decide what happened in the end. The film brings a lump to one’s throat. A Bench of Mr Justice K. G. Balakrishnan and Mr Justice A. R. Lakshmanan dismissed the CBI appeal against the Allahabad High Court order quashing the charges against Akhilesh Singh for not finding any prima facie evidence to proceed with the trial against him. The trial court had framed charges against Akhilesh Singh and four of his alleged henchmen in the case on September 27, 1990, while exonerating former Union Minister and Congress leader Sanjay Singh, a scion of the Amethi royal family, and Modi's wife Amita Kulkarni Modi. The CBI had alleged that the murder had been conspired by Sanjay Singh and Amita with the help of Akhilesh and his henchmen as Sanjay and Amita, who had intimate relations, wanted to get rid of Syed Modi, who was shot dead on July 28, 1988. Sanjay Singh and Amita Modi had later married after their discharge in the case by the trial court. The trial court had, however, framed charges of murder and conspiracy and under the Arms Act against Akhilesh Singh and his associates, Amar Bahadur, Bhagwati Singh, Jitendera Singh and Balai Singh. After the discharge of Sanjay Singh and Amita, Akhilesh Singh had moved an appeal against the trial court order in the Allahabad High Court on the ground that there was also no evidence against him like Sanjay and Amita, which was allowed in 1997. The CBI had challenged the High Court order in the apex court, claiming that there was sufficient evidence to go ahead with the trial against him. Akhilesh Singh, who was earlier in the Congress, had contested the last assembly election on the regional outfit Akhil Bharatiya Congress Dal ticket from the high-profile Rae Bareilly seat, an important segment of the Lok Sabha constituency represented by Congress President Sonia Gandhi. Following the Supreme Court dropping charges against MLA from Rai Bareilly Akhilesh Kumar Singh in the murder of ace badminton player Syed Modi in 1988 the maverick legislator has threatened to lodge a Rs100-crore defamation suit against the Congress for falsely implicating him. Speaking to TNS, Mr Akhilesh Singh said that he had already contacted his lawyers and would soon send a notice to Sonia Gandhi’s Congress for damaging his reputation. SSP Anand Swaroop here said the aim of such an invitation was to find out ways in which the police could seek help in checking the crime rate in the district. He said the invitees for the tea-party held yesterday, were those criminals who were out of jail. The aim was also to ask them as to what circumstances compelled them to resort to crime, and if given a chance, would they leave the path of crime and look forward to leading a normal life, Mr Swaroop said. Of the 274 who came to attend the tea-party, more than 250 had once been notorious criminals. He said the invitees were also given an opportunity to disclose their experiences on different types of crimes. Mr Swaroop said the invitees were assured that they would be connected to mainstream of life, if they promised to leave crime and help the police in checking crime rate. The replicas, one in gold and another in bronze, are to be placed in Vishwa Bharati, Shantiniketan. The original medal, which Tagore received for his collection of poetry ‘Gitanjali’ in 1913, was stolen along with some other invaluable documents from Viswa Bharati campus in March this year. After intensive investigations failed to yield results, the university had requested the Swedish Government to consider minting a replica for exhibition purposes. The Swedish Government’s gesture of goodwill has come just two days ahead of Nobel Day when Nobel prizes for the year are given. In his suit Kher reportedly maintained that Surjeet had defamed him in an article in People's Democracy by calling the former an RSS man. Kher, who was appointed Chairman of the Central Board of Film Certification by the former NDA Government, was removed from his post in October. Kher cited six witnesses, including film-makers Mahesh Bhatt, Yash Chopra, Ashok Pandit and Vijay Kher, in support of his defence that he did not subscribe to the RSS ideology. He also requested the Prime Minister to reconsider the decision of limiting the concessions to only those units which are set up by March 31, 2007. He said the state had made significant investment in social sector and has achieved good results in social development. He said investment in industrial and service sector was required to sustain this development, which in the present environment, can come only through private sector.